In a small cottage on the borders of a forest lived a poor laborer, who gained a scanty living by cutting wood. He had a wife and two children who helped him in his work. The boy's name was Valentine, and the girl was called Mary. They were obedient, good children, and a great comfort to their parents. One winter evening, this happy little family were sitting quietly round the hearth, the snow and the wind raging outside, while they ate their supper of dry bread, when a gentle tap was heard on the window, and a childish voice cried from without: "Oh, let me in, pray! I am a poor little child, with nothing to eat, and no home to go to, and I shall die of cold and hunger unless you let me in." Valentine and Mary jumped up from the table and ran to open the door, saying: "Come in, poor little child! We have not much to give you, but whatever we have we will share with you." The stranger-child came in and warmed his frozen hands and feet at the fire, and the children gave him the best they had to eat, saying: "You must be tired, too, poor child! Lie down on our bed; we can sleep on the bench for one night." Then said the little stranger-child: "Thank God for all your kindness to me!" So they took their little guest into their sleeping-room, laid him on the bed, covered him over, and said to each other: "How thankful we ought to be! We have warm rooms and a cozy bed, while this poor child has only heaven for his roof and the cold earth for his sleeping-place." When their father and mother went to bed, Mary and Valentine lay quite contentedly on the bench near the fire, saying, before they fell asleep: "The stranger-child will be so happy to-night in his warm bed!" These kind children had not slept many hours before Mary awoke and softly whispered to her brother: "Valentine, dear, wake, and listen to the sweet music under the window." "Blest be the house wherein thou liest. Happiest on earth, to heaven the highest." In the east was a streak of rosy dawn, and in its light they saw a group of children standing before the house, clothed in silver garments, holding golden harps in their hands. Amazed at this sight, the children were still gazing out of the window, when a light tap caused them to turn round. There stood the stranger-child before them clad in a golden dress, with a gleaming radiance round his curling hair. "I am the little Christ-child," he said, "who wanders through the world bringing[Pg 289] peace and happiness to good children. You took me in and cared for me when you thought me a poor child, and now you shall have my blessing for what you have done." 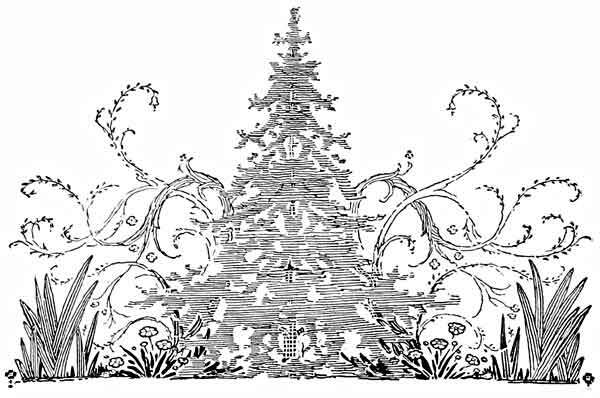 A fir tree grew near the house; and from this he broke a twig, which he planted in the ground, saying: "This twig shall become a tree, and shall bring forth fruit year by year for you." 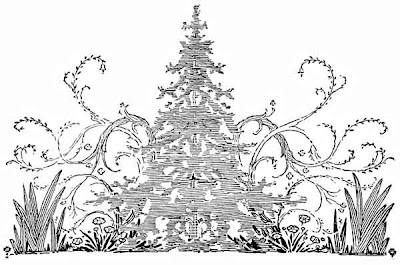 Such is the story told to German children concerning their beautiful Christmas trees, though we know that the real little Christ-child can never be wandering, cold and homeless, again in our world, inasmuch as he is safe in heaven by his Father's side; yet we may gather from this story the same truth which the Bible plainly tells us—that any one who helps a Christian child in distress, it will be counted unto him as if he had indeed done it unto Christ himself. "Inasmuch as ye have done it unto the least of these my brethren, ye have done it unto me."